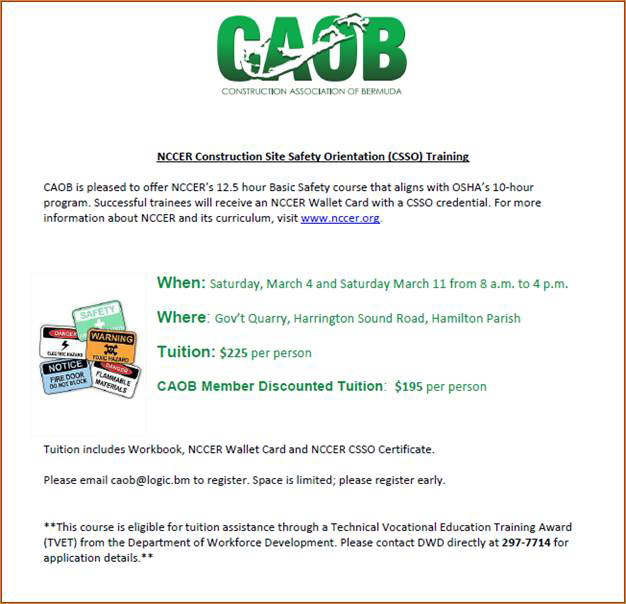 The Department of Workforce Development is advising tradespersons and general labourers that funding is available for NCCER Construction Site Safety Orientation training on Saturday, March 4 and March 11 from 8.00am to 4.00pm at the Government Quarry on Harrington Sound Road in Hamilton Parish. A Government spokesperson said, “The Department of Workforce Development wishes to advise unemployed Tradespersons and General Labourers that funding is available for the following course. “Details of the course and instructions for registration are outlined below. Please note that this course is the minimum requirement/credential for employment on several of the upcoming construction projects [i.e. airport redevelopment]. “If you are an unemployed tradesperson or labourer, please contact DWD at 297-7714 for assistance with registration or funding for the course. Alternatively, you can walk-in to the Department and register at 23 Parliament Street in Hamilton or email dwd@gov.bm. Tuition cost is $225 per person; for CAOB members, the cost is $195. Tuition includes workbook, NCCER wallet card, and the NCCER CSSO Certificate. For more information about NCCER and its curriculum, visit the website. To register, email caob@logic.bm; space is limited.